For more than 30 years, Chef Ed Brown has cultivated a culinary prowess by working in some of the most celebrated kitchens in the world. His passion and considerable talent have earned him wide acclaim, including numerous New York Times stars and a Michelin star. As one of America's leading chefs, his varied experience is synonymous with culinary innovation, quality food and entrepreneurial spirit. 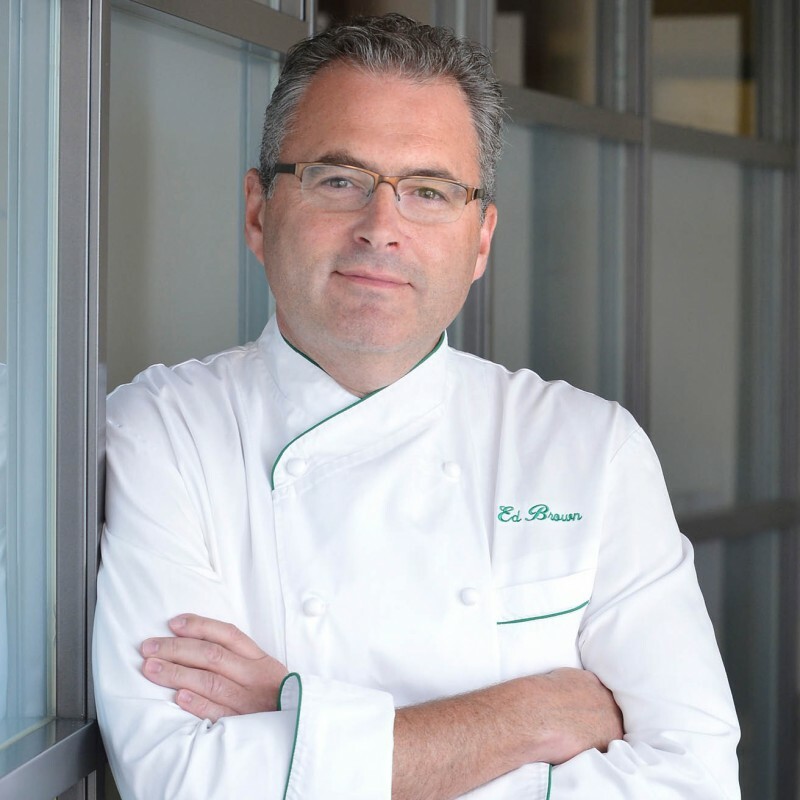 A 1983 graduate of the prestigious Culinary Institute of America, Brown's professional life began at the New York Times three-star Maurice Restaurant as Sous Chef working beside Chef Christian Delouvrier. After two years, Brown journeyed to Paris and the kitchen of the famous Michelin three-star Lucas Carton as Chef de Partie Tournant. It was during this time that Brown was introduced to the cuisines of the world and the variety of techniques that are still evident in the combinations, flavors and simplicity of his cooking style today. After a brief stopover at the now-shuttered but much-beloved Judson Grill, Brown took over the stoves of The Sea Grill, the gem of the Restaurant Associates family. During his 14 years as Executive Chef Esquire magazine called The Sea Grill "one of the best restaurants in the world" and Brown, "perhaps the most impressive talent in his field." Throughout Brown's career, he has earned an impressive 14 stars from The New York Times for such properties as Marie Michelle, Tropica, Judson Grill and The Sea Grill. In 2008, Brown fulfilled his lifelong dream of owning a restaurant, and opened Eighty One. The Upper West Side eatery was an immediate hit and earned a highly coveted Michelin star. In March 2010, in light of a tumultuous economy and shifting demands from the neighborhood, Brown made the decision to close the restaurant and pursue other opportunities which included a return to Restaurant Associates as the company's Chef/Innovator and SVP. Additionally, in 2009, he created the casual, yet authentic, seafood eatery, Ed's Chowder House. In 2015, Brown returned to the US OPEN project where he re- conceptualized ACES by Ed Brown, the premium level seafood restaurant that operates during the 14 days of the annual premier New York event. Brown is a frequent guest on NBC's Today Show, CBS's Morning Show as well as a 2010 competitor on Iron Chef America and judge on Beat Bobby Flay. Brown is the author of The Modern Seafood Cook, a comprehensive guide to buying and preparing seafood and fish. He has also contributed to other cookbooks, including the updated Joy of Cooking (Scribner, 1997), Chef Pierre Franey's 60 Minute Gourmet (Clarkson Potter, 2000) as well as other publications. In January of 2018, Brown was again promoted to President, Restaurant Services. In addition to his new role, he continues to be the head of Culinary for Restaurant Associates.